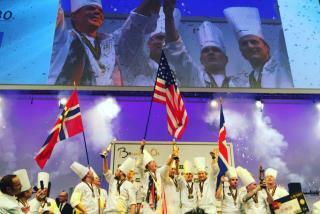 (Newser) – Team USA won big at the annual culinary Olympics in France, capturing the gold medal—the coveted Bocuse d'Or—for the first time. The American chefs wowed the judges with their take on a Lyonnaise classic, poulet bresse aux ecrevisses (chicken and crayfish), beating 23 other teams on Wednesday to take top honors in the 30-year-old contest. Norway followed and Iceland took the bronze, while the home team was relegated to fifth. A decade ago, team USA president Thomas Keller promised Paul Bocuse, the legendary French chef and contest namesake, that the US would one day "make it to the top of the podium." He tells the New York Times, "We made it in nine." The challenge this year in a packed Lyon hall was to whip up a meat and a vegan dish in five hours 35 minutes, undistracted by blaring horns and a thousand shouting, flag-waving fans. When did cooking become a sport? The platter appears purely decorative and doesn't seem to contain anything edible. Presentation taken perhaps a bit too far. Of course, we're not the fattest nation in the world for nuttin'.